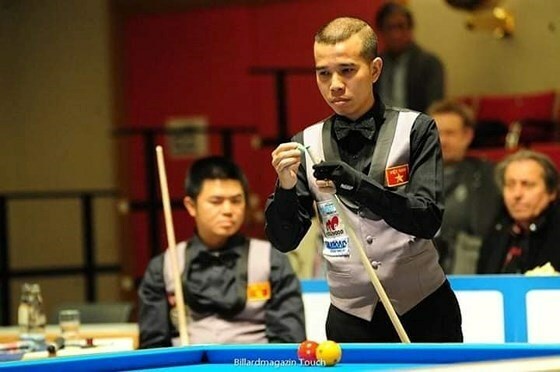 Hanoi (VNA) - Vietnam on March 17 lost 35-40 to the Netherlands in the quarterfinals of the ongoing world three-cushion billiards tournament - the German 1st Bundesliga. The Vietnamese team with two players in the world’s top ten, Tran Quyet Chien (ranking 6th in the world) and Nguyen Quoc Nguyen (ranking 9th in the world), faced the world’s number one Disk Jaspers and Raimond Burgman (129th) from the Netherlands. Chien and Nguyen took the early advantage with a lead of 16-6, but Jaspers and Burgman pegged them back to 20-20. The Vietnamese players fought back to 32-23, but with a slice of luck and resolve the Netherlands triumphed 40-35 for a place in the semifinals where it will play against Turkey. The other semifinal game will be a competition between the Republic of Korea and Belgium. This is the second time Vietnam has reached the quarterfinals in ten attempts.